The Indianapolis Colts today signed fullback Robert Hughes and waived wide receiver Griff Whalen. Hughes, 5-11, 235 pounds, rejoins the Colts after being waived by the team following the preseason finale at Cincinnati. He played in five games (one start) with the Colts in 2012 and recorded one rush for five yards and one reception for three yards. Hughes was originally signed by the Chicago Bears as an undrafted free agent in 2011. Whalen played in three games this season and caught two passes for 28 yards. He was originally signed by the Colts as an undrafted free agent on April 30, 2012. 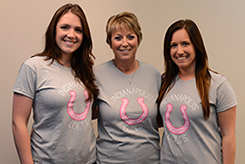 The Indianapolis Colts Women’s Organization will be selling special edition Colts t-shirts during the month of October and will donate all proceeds to the IU Simon Cancer Center. 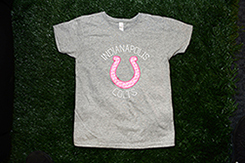 The t-shirts are gray and feature a pink Colts horseshoe on the front. They are $20 each and will be sold at the team’s “Pinking of the Canal” event on October 4, as well as their October 6 game versus the Seattle Seahawks. At the game, the t-shirts will be available in the American Family Insurance Touchdown Town, on Lucas Oil Plaza inside the north end of the stadium, and near sections 117 and 143 on the main concourse. The Colts finished the month of September at 3-1 after their 37-3 victory over the Jacksonville Jaguars on Sunday. Today’s news looks at the big play ability of Darius Butler, avoiding the mousetrap and the defensive effort over the last two weeks. Take a look below at the top pieces from Monday, September 30th. There’s something about Colts cornerback Darius Butler and his ability to turn turnovers into points all by himself. “You only get so many opportunities on the defensive side of the ball to get the ball in your hands,” Butler said. “You want to do something more with it. It’s obviously huge. Butler has returned four of his eight career interceptions for touchdowns. Coach Chuck Pagano had a mid-week project at Lowes this past week in trying to let his players know the importance of Sunday’s game against the Jaguars. There was no looking back on the 49ers win and no looking forward to a matchup with undefeated Seattle. So the coach placed mousetraps in each of his players lockers to make sure the focus was heightened. The win set the stage for next week’s game against the undefeated Seattle Seahawks at Lucas Oil Stadium in Indianapolis. The Colts are tied with Tennessee atop the AFC South with a 3-1 record. For the second straight week, the Colts held their opponents to single digits and have now provided a string of quarters for an elite defense. It would be easy to wonder if the Colts’ defense is for real because they played the Jaguars, who are just treading water these days. But that thought should quickly get erased because Indianapolis did the same thing to the 49ers. The Colts have only given up 459 yards, 28 first downs and 10 points in the past two games. It’s time to look at the Colts as more than an offensive team. Coach Chuck Pagano’s defensive mindset and coordinator Greg Manusky’s schemes have sunk in. It just took a little while for it to happen. This blog is one of our “Fan Features,” from Alyssa who won the New Era “Speak with Your Cap” contest and was chosen to represent the Colts as their ambassador for a photoshoot. Below is a recap of her trip to New York and all the fun she had representing Colts Nation! “In June I had the amazing opportunity to take part in the NFL’s and New Era’s back to football Photo Day. The Photo Day took place in New York at a studio called Location 5. Being a small town Canadian girl I couldn’t believe what I was reading when I received an email telling me I had been chosen to represent the Colts! From my understanding my boyfriend and I were to be flown to New York and I was to partake in a Photo Day working with the NFL and New Era. To my surprise it was so much more than that. On top of being styled by professionals in the sickest Colts gear and New Era hats and getting my photo taken, there was also an interview and a video portion (see below). There is no question about it, I love being in front of the camera whether it be video, full body or profile shots. Another amazing surprise was that we got to tour the NFL headquarters! We had the chance to see where the Commissioner did his work, had meetings and where the games were reviewed for any fines or missed calls. Not to mention every super bowl ring dating back to the very first super bowl. Seeing the NFL headquarters for any football fan is like being a kid in a candy shop, I just couldn’t get enough. Thinking that this experience couldn’t get any better, I was completely blown away when the Commissioner himself, Roger Goodell showed up at the studio for our group shot. He did a meet and greet with all the team winners, signed mini footballs and took individual photos with us. This was a once in a lifetime experience and I would like to thank the NFL and New Era for letting me be part of the Photo Day. I think what made it so over the top incredible were all my fellow winners (and guests of course) from the other teams. Everyone was great! I made so many new friends and we became like a New Era and NFL family in that short time we spent together. We still all keep in touch and we’re all battling it out in a fantasy football league this season. The amount of passion I saw in every single fan has made me fall in love with football and the Colts all over again. All 32 fans and guests came from all over the world, some from England, some from Canada and some from the United States. We all cheer for different teams but we all came together through one sport, football. It made me realize that football is so much more than a sport, it unites people together and makes life long friends. For this week, the Colts are now 2-1 after a Week Three 27-7 road victory over the San Francisco 49ers. 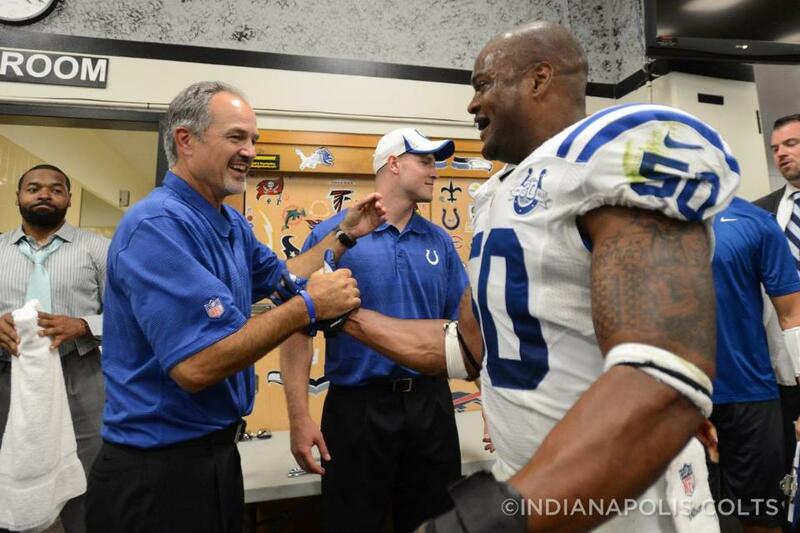 What were your thoughts on the Colts first road win of 2013? What are your expectations as the Colts close out the month of September and open up AFC South play with a trip to the Jacksonville? The Colts will wrap up their practice schedule this week on Friday in preparation for this weekend’s match up with the Jacksonville Jaguars. Here’s a look at today’s news with Chuck Pagano’s one-year anniversary of being diagnosed with leukemia, the task of stopping Maurice Jones-Drew and Jerrell Freeman’s pass rushing. Take a look below at the top pieces from Friday, September 27th. The one-year anniversary of Pagano being diagnosed with leukemia took place earlier this week and Kravitz looks at the head coach’s perspective on life. Every day now is a gift. Has been since Dr. Larry Cripe of the IU Health Simon Cancer Center declared he was in remission. “I was talking to my wife (Tina on Tuesday night and Wednesday morning), and we were saying, it almost seems surreal that it’s been a year,’’ Pagano said. “Just the way things are going, how good I feel, I feel like it almost never happened. It’s crazy. It went so fast. Now, those first couple of months, it didn’t go fast when we were going through it (chemotherapy), but now it’s like it happened to somebody else. Colts fans know all too well what Pro Bowl running back Maurice Jones-Drew can do to an opposing defense. The Colts defense is MJD’s opposition this week. Jones-Drew is 5-7, 210 pounds. He routinely has his way with the Colts’ defense. In 13 appearances, he’s averaged 106.8 yards per game and 5.4 yards per attempt. Eight of his 24 career 100-yard games have come against the Colts, including 177- and 169- and 166-yard outings. DE Cory Redding has the sure-fire remedy for containing Jones-Drew. “One guy get there, hit him high, slide down to the ankle and hold on until the other 10 guys get there. That’s how you stop him,” he said. No inside linebacker in the NFL has more sacks in 2013 than Jerrell Freeman. Last year, Freeman was one of the top tacklers in the NFL and now he has added a pass rushing element to his game. Getting strip-sacks has been a staple of Freeman’s already this season. He had one against Miami’s Ryan Tannehill in Week 2. Then he had one in the in the fourth quarter of Sunday’s victory over the San Francisco 49ers. Freeman sacked and stripped the ball from 49ers quarterback Colin Kaepernick at San Francisco’s 8-yard line. The Colts scored three plays later to take a 27-7 lead. Robert Mathis got one of the last scholarships available at Alabama A&M, yet made it to the NFL. Mathis is the smallest of his male siblings, yet he has scaled great heights. With four more sacks, he will become the 30th NFL player to reach 100 for a career. He always has proven himself because he’s always been driven. “I am here by no accident because of the truth of the saying, ‘It’s not the size of the dog in the fight, but the size of the fight in the dog.’ I’m the smallest male in the family,” said Mathis. “I always was told to fight, but I had it in me anyway. Any fight comes from the existence of a heart, something that Mathis has in abundance. Part of that heart keeps him in touch with the Alabama A&M, and he has benefited the university in many ways. Mathis, in turn, is being honored by others. On Friday, he will be in his native Atlanta as he is inducted into the National Black College Alumni Hall-of-Fame. It, no doubt, will have a special meaning for a man who has made deep footprints everywhere he has been. Some athletes have quotes that mean something to them. Some don’t. Mathis does and carries it to the extent that is it tattooed on his stomach. Emblazoned on his ripped, 6-2, 246-pound torse is his favorite quote. Back in late May, Colts linebackers coach Jeff Fitzgerald talked about the versatility his group had and how implementing that would be the next step heading into 2013. Moving players around and allowing the Colts pass rush to thrive on third downs was something Fitzgerald was looking for out of his linebackers. Jerrell Freeman was a tackling machine in his first NFL season last year but he has taken Fitzgerald’s offseason wish and made it come true. Freeman 3.0 sacks are tied for ninth in the NFL and he’s the only inside linebacker in the league with more than 1.5 sacks. Two of those sacks have come on third downs and in both of those cases Freeman has forced a fumble with the Colts recovering the loose ball. The 15 takeaways the Colts had last season were one of the fewest in the NFL and Freeman is doing everything he can to change that number. “We just try to get turnovers, try to make a difference out there. That’s what we preach,” Freeman said on Wednesday. Perhaps the most impressive indication of Freeman’s play in 2013 is he still has 26 tackles, which ranks near the top of the NFL. Freeman’s 26 tackles is the most tackles for the top 64 players on the sack list after three games. Last year, Freeman was a much needed catalyst in the middle of the Colts defense. He is once again doing that in 2013 and has even added another dimension to his game that not many inside linebackers possess. “He’s a good athlete. He studies the game, he works hard, he can run,” head coach Chuck Pagano says about Freeman.